'Differance' is a neologism coined by the French-Algerian philosopher Jacques Derrida to describe the play of (spatial) differences and (temporal) deferrals in the role of generating signified meanings. His use of the term revolves its simultaneous double signification of two apparently different meanings. 'Differance' differs from the word 'difference' only in writing - the substitute of the 'e' for an 'a' is not vocalized. The text linked below is a transcript of a lecture delivered to the Société of The Sorbonne in 1968 in which Derrida talks us through his thinking around this term. The essay draws on the double meaning of the french word différer - in English translated as either to differ or to defer. Derrida identifies deferring as a temporalizing effect and differing as spatial. Drawing on Saussure, he points towards the deference at play in any system of signs -the signified is never truly present -, and the differences that enable us to make sense of words - "Within the system of language, there are only differences". Derrida places 'differance' here - neither a concept nor a word, but the possibility of conceptuality itself. 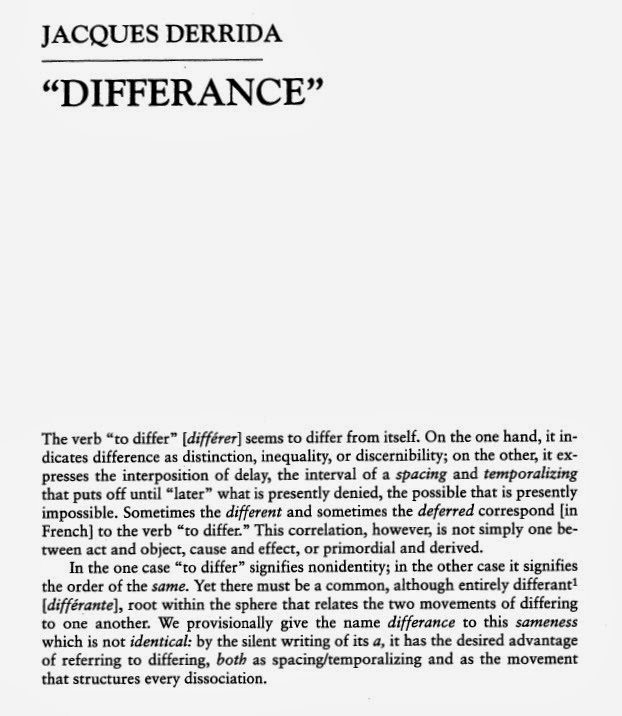 'Differance' is what makes the movement of signification possible, it produces the differences that makes language possible. Derrida draws a distinction between language and speech, arguing that speech participates in an existing language and is constituted by it; it is language that makes speech possible: Differance is speech's relationship to language. The Open File blog is an ongoing curatorial conversation between artist Jack Brindley and curator Tim Dixon.